Our Restored Bodies What will our resurrected bodies be like? One of the greatest hopes of the Gospel is the defeat of death and the resurrection of our bodies. This flies in the face of the pop-Christianity belief of our bodies remaining in death and our spirits ascending to an immaterial heaven to be for all eternity. The concept of separating our physical identity from our spiritual identity was a foreign concept to the ancient minds who wrote the scriptures. Instead, God promises us an eternity that is not very different from the life we know now, but made radically better in every way. Upon the resurrection, our bodies will be raised from the ground to new life. We won’t be given a new body. Rather, our own body will be reanimated, given life again, and will be restored and renewed. Our bodies will be transformed. When our dying bodies have been transformed into bodies that will never die, this Scripture will be fulfilled: “Death is swallowed up in victory. O death, where is your victory? O death, where is your sting?” For sin is the sting that results in death, and the law gives sin its power. But thank God! He gives us victory over sin and death through our Lord Jesus Christ. When Jesus returns, whether we have been dead for minutes or centuries, our bodies will be raised from the grave and transformed. But what about those who are still alive when Jesus returns? We will not all die, but we will all be transformed! It will happen in a moment, in the blink of an eye, when the last trumpet is blown. For when the trumpet sounds, those who have died will be raised to live forever. And we who are living will also be transformed. For our dying bodies must be transformed into bodies that will never die; our mortal bodies must be transformed into immortal bodies. Just like how the “new heavens and new earth” won’t be new “from scratch”, but rather renewed, so too our bodies will be renewed. When the Bible talks about a “resurrection of the dead” it means that the dead will be resurrected. That which is dead will be made alive again. That is the definition of resurrection. If God was going to be starting over and making new bodies for us, scripture wouldn’t use phrases like “the dead will be raised” (1 Corinthians 15:52). …the Lord Jesus Christ, who, by the power that enables him to bring everything under his control, will transform our lowly bodies so that they will be like his glorious body. We have a pretty clear example in scripture of what our renewed bodies will be like through the resurrected Christ. On the third day after his death, Jesus was raised from the dead. His tomb was empty (Luke 24:1-6). 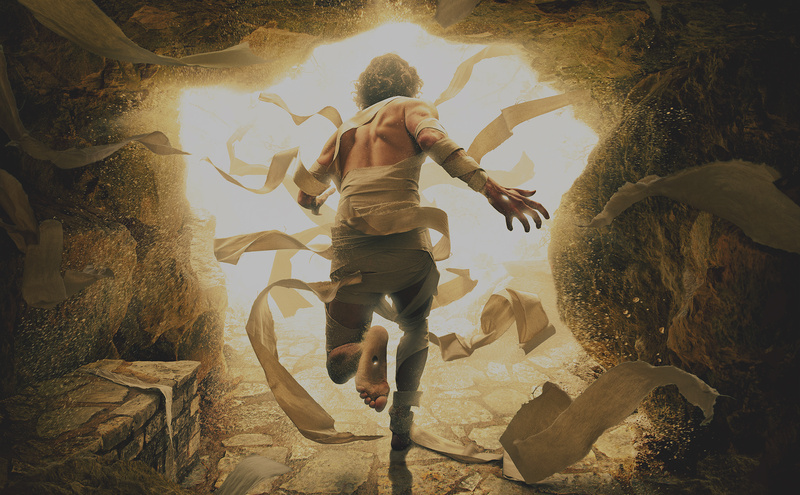 There wasn’t a body in the tomb because he got up and walked out— using his own body! His disciples, in their disbelief, thought he was a spirit. Look at my hands. Look at my feet. You can see that it’s really me. Touch me and make sure that I am not a ghost, because ghosts don’t have bodies, as you see that I do. He was brought back to life with his own body, not a brand-new body. Jesus even still had the scars from his crucifixion (John 20:25, 27). He sat and enjoyed the company of his friends over a meal. Yes, with his resurrected body, Jesus was still eating food (Luke 24:41-43). It is comforting to know that such a core component of our existence will be present for eternity. What happened to Jesus, scripture says, will happen to us (1 Corinthians 15:49). Christ has been raised from the dead. He is the first of a great harvest of all who have died. Just like Jesus was raised with the same body, we too will be raised with our same body. It will be transformed though, but how so? In what sense will our bodies be transformed? Paul tells us in 1 Corinthians 15:42-44. He says that our current bodies are weak, perishable, and unglorified, but after the resurrection, they will be powerful, imperishable, glorious, and spiritual. Our bodies will be powerful— they will not be subject to stress or fatigue or weakness. Our bodies will be imperishable— they will not get sick, die, age, or become injured. Our bodies will be glorious— they will share the radiance of our creator in a way they currently do not. Our bodies will be spiritual— they will be completely filled with the Holy Spirit. It seems that we may also have capabilities that we currently do not have. In the book of John it is recorded that Jesus was able to either walk through walls or teleport (John 20:19, 26). He appeared suddenly in the home to the disciples, even though the doors were locked. Jesus then went on to demonstrate that he had a physical body. Since scripture tells us that what happened to Christ will happen to us, it is very possible that our renewed bodies will be able to do things they currently can’t. How exciting is that? The time is coming when all the dead in their graves will hear the voice of God’s Son, and they will rise again. Those who have done good will rise to experience eternal life, and those who have continued in evil will rise to experience judgment. Interestingly, the resurrection of our bodies will come to every person who has ever lived (Acts 24:15). Scripture says that those who are citizens of the Kingdom of God will have eternal life, while those who are not will be destroyed (Matthew 10:28). God gives his children the gift of eternal life. Only those who have renounced their worldly citizenship and pledged their allegiance to Christ’s nation will inherit the Earth. You will be able to feel the dirt under your feet. You will be able to swim in the seas. You will be able to explore the planet with your own eyes. You will be able to eat and drink with the company of others. Eternity won’t be completely foreign, God will just perfect what he started so many thousands of years ago. That is a glorious thing. You’re Not Going To Heaven No one is in heaven, sorry. Resurrection of the Dead Everyone's coming back. Your New Birth Certificate What does it mean to be "born again"? Renewed Creation God chooses to restore rather than destroy.